A TIME TO STEP UP OUR ACTION! The Ontario Government has broken yet another commitment to 1.5 million Ontarians with disabilities. In last October's Throne Speech, the Government promised an "action plan" of some sort on the ODA to be in place during that session of the Ontario Legislature. Over many months since then, the Government repeatedly committed that this action plan would be in place by June of this year. The Legislature apparently adjourned for the summer in June, 2000. Yet no action plan has been announced. July 26, 2000 is the 10 year anniversary of the signing into law of the Americans with Disabilities Act. Although it is not perfect, that law gives Americans 10 years of progress to celebrate. In contrast, Ontarians have five years of inaction and broken promises. It's time to step up our action. Our goal is to build even more public support for a strong Ontarians with Disabilities Act, and to get our clear message through to the Ontario Government. This Action Kit gives three major suggestions on how you can do this. If you have other ideas, contact us. We are always eager for more ideas. We also want to know what you have tried on your own, or with an organization to which you are connected, or with friends and family. Even though Premier Harris promised in writing in 1995 to personally work together with the ODA Committee to develop this new law (which he would pass in his first term), he has consistently refused to even meet with the ODA Committee. Instead, he sends us to meet with a series of revolving-door powerless Citizenship ministers. They have no mandate to do anything. Most recently, Premier Harris refused to even answer our letter. Instead, he passed this task off onto his "director of tours and public events". If Premier Harris won't talk to the ODA Committee, try to get him to talk to you! We encourage one and all to pick up the phone and call Premier Harris at his office, either at Queens Park or in his constituancy office in North Bay. He even has a TTY number at Queens Park for deaf, deafened and hard-of-hearing people. Our new slogan is "Call Mike!" Place your call. Ask for Mike Harris. 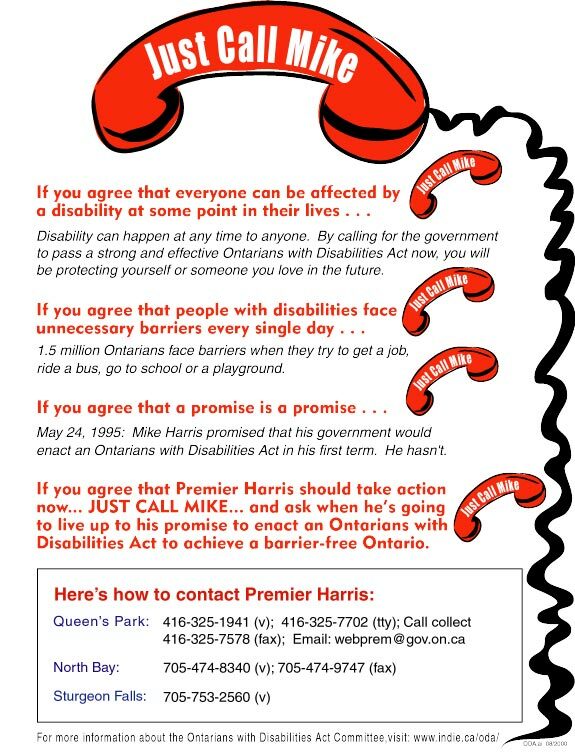 Tell him you want to know where the Ontarians with Disabilities Act is that he promised us over five years ago! If you do not want to pay for long distance charges, try calling collect. If you do not get satisfaction, call back again another day! Call once a week over the next several weeks if you have to to get a satisfactory answer from the Premier himself. 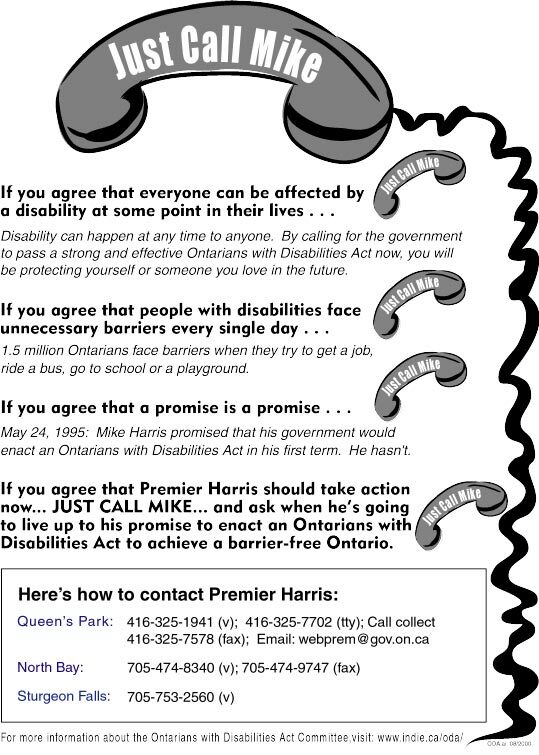 Tell whoever takes your calls about the barriers you face and why you need a strong Ontarians with Disabilities Act now. Every single call really helps! If you would prefer not to call, you still can write the Premier. But we think that at this point, after so many broken promises to us, it's time to pick up the phone and to try to make direct contact with the person who made the promises to us. Also, encourage your friends and family to do the same. Organize folks to do this as a group effort. Let us know what response you get. Each call requires the Premier's staff to deal with you and seek some sort of answer. Show how much support there is for a strong ODA. Follow this link to view and/or print the poster in either colour or black and white. Try to take every opportunity over the next months to make ODA and other local disability concerns an important issue in your community during this fall's municipal elections. While it is the Ontario Legislature that must pass the ODA into law, there's lots that can be done to help build support at the municipal level. Many of our ODA Committee Regions have done a great job of getting their local municipal councils to pass strong resolutions which urge the Ontario Government to keep its promise to us regarding the ODA. London, Windsor, St. Catharines, Niagara Falls, Toronto, Whitby, Durham Region, Lindsay and Ottawa are among those who have passed resolutions. These are posted on our web site at http://www.odacommittee.net/resolutions.html or can be requested from us. If you know of other councils that have passed such resolutions please let us know. Here are ideas on what you could do to raise this issue during this fall's municipal elections. You can also use many of the action tips that we circulated during the 1999 provincial election, which you can find at the bottom of this page... or by contacting us. * Contact your nearest ODA Committee Regional Contact to see what is being planned in your area. If none are planned, help get things going. You can get a list of all ODA Committee Regional Contacts from our web site or by contacting us. * Ask each of your local candidates for municipal council, regional council and school board to commit to supporting the passage by the Ontario Legislature of a strong and effective Ontarians with Disabilities Act as soon as possible. Ask them to express this support to the Ontario Government. If your local council has not yet passed a resolution supporting a strong ODA, then ask candidates to commit to introduce and to vote for such a resolution. Ask them to commit to the goal of achieving a barrier-free municipality. You might send out a survey questionaire to each candidate seeking their positions on this issue and other local disability issues of importance to you. If you want a sample survey to send candidates, contact us. One will be available in the next few days. A sample resolution for municipal councils can be obtained from the ODA Committee. * Contact candidates who have a record of championing the cause of people with disabilities. Ask them to mention the ODA in campaign literature and especially in media interviews. Offer to meet and explain to them about the ODA and related issues, and to show why this is a good election issue. * Attend all-candidates debates to raise this issue. Ask each candidate for their commitments. Bring along ODA literature that you can get from us or our website. Publicize upcoming all-candidates' debates to ODA supporters in your community to help ensure that we have a good turnout, and that the issue is raised from the floor. * Raise other local issues of concern to people with disabilities in your community during the municipal election campaign. * Insist that the municipal elections be entirely barrier-free so that all people with disabilities can fully participate. For exampe, demand that all polling stations and all-candidates' debates be accessible, and that needed accommodations such as American Sign Language and Braille campaign materials are available where needed. Again, use the action tips on this point that we circulated during the 1999 election. * Contact your local media to try to get coverage on this as an issue in the upcoming municipal elections. Encourage them to do coverage on the positions of the various candidates on this issue. Write letters to the editor. Call "phone-in" radio programs. * Contact like-minded groups/supporters early to ask them to help spread the word at their own board meetings and in their newsletters. A provincial bi-election is expected soon in a Hamilton area riding. The Hamilton Region of the ODA Committee is already making plans to actively raise the ODA during this campaign. Everyone in that part of Ontario is encouraged to take part in this activity. Contact our ODA Committee Hamilton Regional Contacts. Again, urge that this campaign and the bi-election itself be entirely barrier-free.